Circuit Breakers are Cutler-Hammer Series C Industrial style with thermal-magnetic trip, non-interchangeable trip units. E-Frame (208V Applications) Series C circuit breakers Type ED are rated from 100A to 225A continuous current. 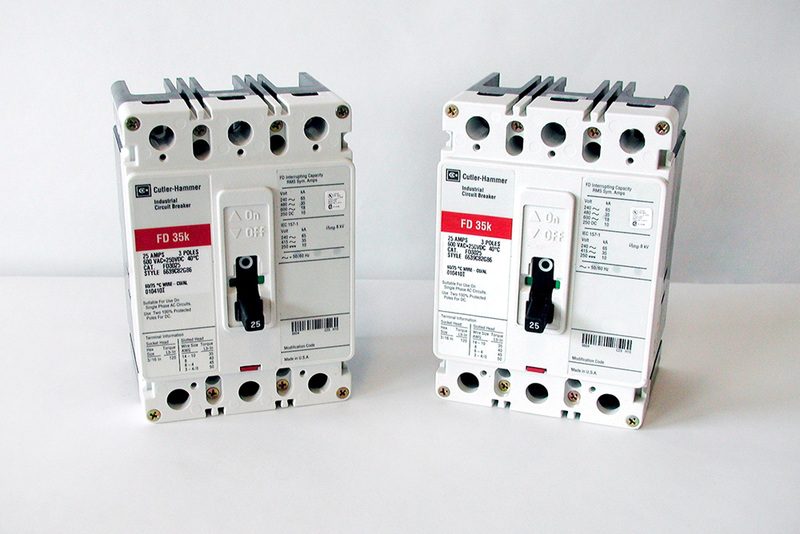 F-Frame (208 and 480V Applications) Series C circuit breakers Type FD are rated from 10A to 225A continuous current. Circuit breakers are listed in accordance with Underwriters Laboratories, Inc. Standard UL489. Breakers ordered separately are provided with all hardware for mounting to PDSC panel. Breakers are available in higher interrupting ratings if required. Please contact GBE for pricing and availability. Terminal wire connectors are installed on load side of breaker. Internal accessories such as shunt trip, undervoltage relay, and auxiliary contacts are available. Please contact GBE for price and availability.